INCHEON, SOUTH KOREA - The 17th Asian Games kicked off with a lavish opening ceremony Friday, with YouTube singer PSY getting the crowd jumping for the curtain-closer with his popular “Gangnam Style” to kick off the contental extravaganza. 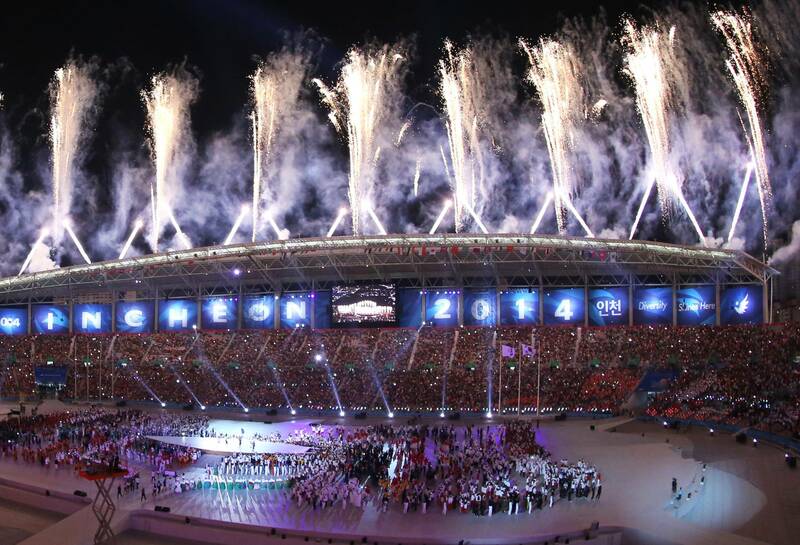 The ceremony at Asiad Main Stadium was the opening showcase for the 16-day event in which nearly 10,000 athletes will compete for 439 gold medals on offer in 36 sports (28 Olympic, eight non Olympic) from Sept. 19 to Oct. 4. Both the opening and closing ceremonies are being directed by South Korea movie director Im Kwon-taek with playwright and actor Jang Jin as the artistic director and also feature celebrities, such as opera singer Sumi Jo and Chinese concert pianist Lang Lang. 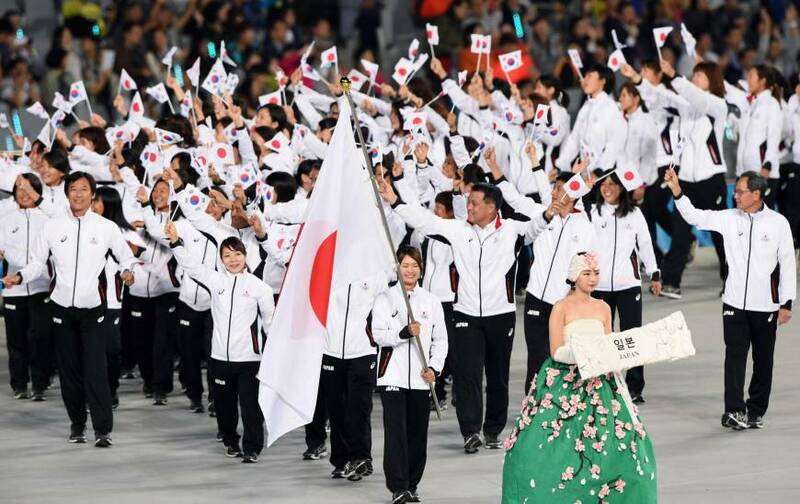 Japan’s team as part of the 1,069-member delegation (712 athletes) was led by team captain and London Olympic weightlifting silver medalist Hiromi Miyake and archer Kaori Kawanaka as flag bearer into the stadium during the parade of nations. The Japanese team was in high spirits following defending champion Nadeshiko Japan’s 12-0 embarrassment of Jordan in their first-round Group B match in women’s soccer on Thursday night. Japan, which has finished in third place behind powerhouse China and South Korea at the last four Games, has made a target of winning around 50 gold medals at the Games. It had 48 top podium finishes at the Guangzhou Games in 2010.
International Olympic Committee President Thomas Bach attended with other dignitaries, including South Korean President Park Geun-hye, Tokyo Gov. Yoichi Masuzoe as a representative for the 2020 Tokyo Games, and other VIPs. Incheon Mayor Yoo Jeong-bok, whose city has come under fire due to concerns of costs and looming potential debt after the Games are through, gave a welcoming address. “I would like to welcome all of you who have traveled here to join the 17th Asian Games in Incheon 2014 for which 4.5 billion Asians have waited,” said Yoo. 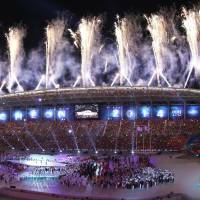 South Korean President Park declared the Games open. The lighting of the cauldron was carried out by five representatives, including women’s pro golfer Park In Bee, with tennis player Lee Hyung-Taik handing the torch to South Korean actress Lee Young-ae, who lit the cauldron with future diving talent Kim Young-ho and up-and-coming gymnast Kim Joo-won. Despite the enthusiasm from the Incheon Asian Games Organizing Committee (IAGOC), ticket sales have lagged, save for a few events featuring South Korean sports stars such as Beijing Olympic champion swimmer Park Tae-hwan. Citizens of Incheon are also still heavy of heart from the Sewol ferry disaster that happened back in April; the doomed ferry embarked Incheon before capsizing and sinking off Jindo island near the southwest corner of the Korean Peninsula, leaving nearly 300 passengers, mostly schoolchildren, either dead or missing. The Games, taking place in this port city west of Seoul, are a testing ground for many young athletes ahead of the 2016 Rio Olympics and the 2020 Tokyo Games six years from now. The 62,000-seat main stadium is one of 17 new venues, which also include a state-of-the-art aquatic center and a new golf course covering an old landfill, built for the Games. North Korea, still technically at war with South Korea after an armistice following the 1950-53 Korean War, has sent a contingent of 150 athletes, marched into the stadium separately from its southern neighbor. PSY and his crazy, hip-gyrating dancing crew were the biggest attraction of the night as chants of “Oppa is Gangnam style” rang out throughout the stadium with athletes and spectators alike dancing in sequence with the Korean pop star.